Earlier this week, we got our first look at Rutina Wesley as Lady Cop courtesy of Arrow star Paul Blackthorne. Now, director Lexi Alexander is stepping into share yet another photo of Lady Cop as she sets out to clean up the mean streets of the newly dubbed Star City. The first Arrow Season 4 trailer has also dropped, which we shared with you yesterday. We have it here again for you in case you missed it. Season 4 of Arrow is currently shooting in Vancouver, with the premiere episode Green Arrow airing Wednesday, October 8 at 8 PM ET on The CW. 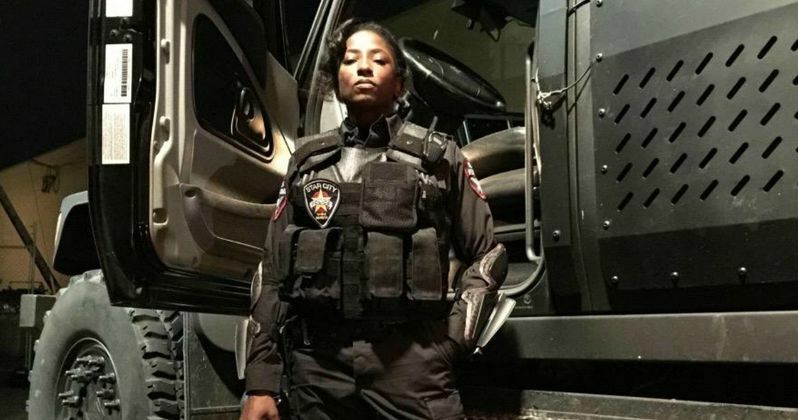 Rutina Wesley's Lady Cop is part of Star City's anti-vigilante task force in Arrow Season 4. We're not sure how far into this new set of episodes she will first appear. Lady Cop is just one of many new characters coming to The CW soon. Others include Neal McDonough as Damien Darhk, Alexander Calvert as Anarky, Echo Kellum as superhero Mister Terrific and Jimmy Akingbola as the villainous Baron Blitzkrieg. The Season 3 finale, "My Name Is Oliver Queen", saw Oliver (Stephen Amell) and Felicity (Emily Bett Rickards) leaving Star City to live a life of domesticated bliss. We'll have to wait and see what brings the couple back to their home city. Caity Lotz, whose character Black Canary was killed in the Season 3 premiere, is making her return in a Season 4 episode of Arrow, where she is brought back to life through the Lazarus Pit and resurrected as White Canary. It's believed this will happen in the same episode that Matt Ryan will guest star as John Constantine, since his character has expert knowledge of the Lazarus Pit. It still hasn't been confirmed which episode Caity Lotz will appear in at this time, so we'll have to wait and see if she crosses paths with John Constantine. Yesterday, we got a sneak peek at Season 4 with the first trailer. While this action-packed preview is short at only two minutes long, it is jammed with new characters, including Season 4's main villain Damien Dahrk (Neal McDonough) and Matt Ryan, who returns from cancelation as John Constantine. Take a look at Rutina Wesley as Lady Cop as she hits the Star City beat. Then watch all the fun and excitement this new trailer has to offer. You know you want to see it again!